___According to a forecast track prepared by analysts at the Goddard Space Weather Lab, this CME will hit Venus during the late hours of Jan. 18th. Because Venus has no global magnetic field to protect it, the impact will erode a small amount of atmosphere from the planet's cloudtops. There's no cause for concern, however, because Venus's massive atmosphere will scarcely notice the loss. The same analysis shows that the CME might deliver a glancing blow to Earth's magnetic field around 1200 UT on Jan. 19th. The impact could cause geomagnetic activity and auroras around the Arctic Circle. 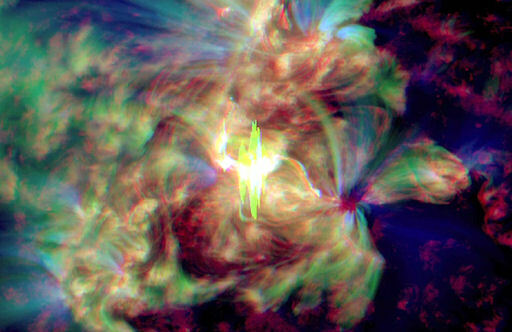 The active sunspot region AR1401/1402/1405 erupted today, Jan. 19th, between 15:15 and 16:30 UT. The long-duration blast produced an M3-class solar flare and a CME that appears to be heading toward Earth. NASA's twin STEREO spacecraft recorded an impressive CME emerging from the blast site. Analysts at the Goddard Space Weather Lab confirm that the CME is heading for Earth, and they say strong geomagnetic storms are possible (although not guaranteed) when the cloud arrives this weekend. Their animated forecast track predicts an impact on Jan. 21st at 22:30 UT (+/- 7 hrs). _CME IMPACT: 22/01/2012 A coronal mass ejection (CME) hit Earth's magnetic field at 0617 UT on Jan. 22nd. At first the impact did not appear to be a strong one: the solar wind speed barely lifted itself to ~400 km/s when the CME passed by. Now, however, in the wake of the CME, a dense and increasingly geoeffective solar wind stream is blowing around Earth, setting the stage for possible auroras on the night of Jan. 22nd. A surge of ground currents in Lofoton, Norway, signaled the CME's arrival.